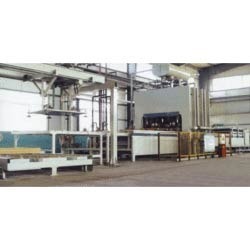 We are one of the leading manufacturers of Short Cycle Lamination Hot Press in India. These are manufactured in compliance with the prevailing industry standards using quality raw materials and advanced production techniques. We also offer these in various specifications to meet the requirements of our esteemed clients. We are engaged in offering our clients with a qualitative range of Short Cycle Laminating Press/ Pre-lamination Hot Press. These are also called as melamine line and are used for producing lamination boards (pre-lam). Our range comprises units used for board feeding (sandwich structure loading), laminating press body, and unloading unit with board inspection, cooling, sorting and stacking. These are available in 4’x8’, 4’x9’, 5’x10’, 6’x9’, and 6’x12’ 7’ x 14’ and larger models. Our range is ideal for lamination of melamine impregnated paper onto particle boards, MDF boards, or HDF boards. Moreover, the melamine faced composites are used extensively for home and office furniture. Some common applications of the boards are furniture board, structure mould board, flooring and mold door skin. Looking for “Short Cycle lamination Hot Press”?